"(That's) something I actually spent quite a lot of time mulling over before I even began 'The Last Mechanical Monster': How does the Robot work? I thought hard and seriously about it for some time, drew a lot of diagrams, and decided it simply can’t, especially with a mostly hollow chest cavity (as shown in the Fleischer cartoon). There’s no way to attach the arms, no place to put a motor for its neck-propeller, no room for an engine or batteries, etc. "Basically I had to decide if I was telling a science fiction story or a fantasy story (I think it’s fair to say Superman himself could go either way), and the total impossibility of the Robot convinced me I was writing fantasy. If this were science fiction, I wouldn’t have filled his chest with gears; since it’s fantasy, and I thought gears looked cool and fit with some themes I develop later in the story, I went for it. 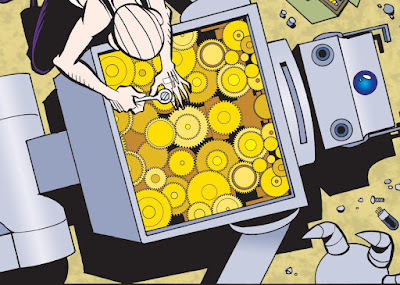 "Think of the gears less as a way to move a robot and more as a metaphor to reveal a character."